Multiple endocrine neoplasia type 2 is an autosomal dominant disorder. MEN 2A is characterized by medullary thyroid carcinoma, pheochromocytoma and hyperparathyroidism; MEN 2B by medullary thyroid carcinoma, pheochromocytoma and characteristic stigmata. Activating germline mutations of the RET proto oncogene are responsible for this hereditary syndrome. Codon 634 mutations are the most common mutations occurring in MEN 2A families whereas a specific mutation at codon 918 is observed in the great majority of MEN 2B families. Analysis of these codons will provide a final diagnosis in the great majority of affected families making unnecessary further studies. To specifically study the codons 634 and 918 we used a minisequencing method as an alternative method to complete sequencing. Using this mutation detection method we were able to reproduce in all cases, representative of 7 families, the information previously obtained by direct sequencing of PCR products. Depending on the number of primers used in the minisequencing reaction, we were able to interrogate either only one nucleotide of the target codon or the three nucleotides simultaneously. This technique appears as a simple, rapid and efficient method for genetic screening of MEN 2 families. It can be utilized to seek for unknown mutations at specific codons or to screen for previously identified mutations and is therefore of interest to study index cases or individuals at risk. Results suggest that complete sequencing is unnecessary. The multiple endocrine neoplasia (MEN) type 2 syndromes comprise three related autosomal dominant cancer syndromes . MEN 2A is characterised by medullary thyroid carcinoma (MTC), pheochromocytoma and parathyroid hyperplasia or adenoma . MEN 2B is similar to MEN 2A except that hyperparathyroidism is rare and characteristic abnormalities such as marfanoid habitus, mucocutaneous and intestinal tract ganglioneuromatosis are present . In familial medullary thyroid carcinoma (FMTC), medullary thyroid carcinoma is the only manifestation . Germline mutations of the RET proto oncogene, which encodes for a receptor tyrosine kinase, are the underlying cause of MEN 2 [5–7]. The majority of mutations in MEN 2A and FMTC families are found in 1 of 5 cysteine codons (609, 611, 618 and 620 in exon 10 and 634 in exon 11) that encode part of the extracellular cysteine rich domain [1, 8, 9]. Codon 634 mutations are the most common in MEN 2A families occurring in 85% of these families . Mutations in FMTC families are evenly distributed among the 5 cysteine codons [1, 8]. Less frequently, mutations are found elsewhere in the RET[10–13]. The great majority of MEN 2B families (95%) present the same mutation (ATG→ ACG) at codon 918 in exon 16 . In a few cases of MEN 2B families a mutation was found in exon 883 . Analysis of codons 634 and 918 of the RET proto oncogene will therefore provide a final diagnosis in the great majority of 2A and 2B families. Different methods have been used to identify RET proto oncogene mutations from which sequencing is the gold standard. In the present study, we adapted the primer extension technique , more frequently known as the minisequencing method [16, 17], to mutational analysis of MEN 2 families. The detection of the products obtained was performed on a capillary electrophoresis system. Mutations at codon 634 were identified either by a single reaction or a multiplex reaction. 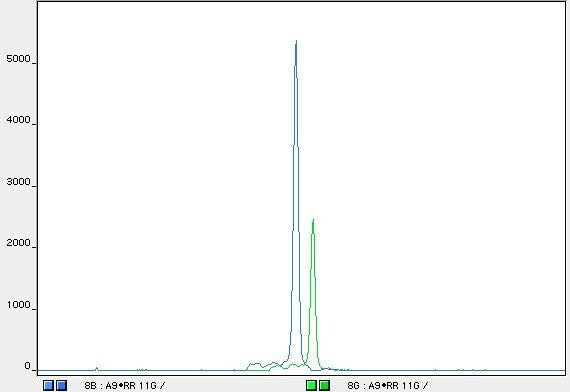 Using only one primer to interrogate the first nucleotide, patients harbouring the TGC→CGC mutation presented two peaks corresponding to T/C reactions as shown in figure 1 in contrast with a single peak observed in normal individuals (fig 2). 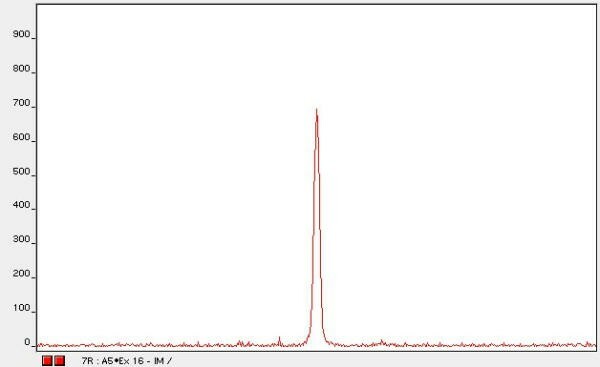 When the three nucleotides were analysed simultaneously, by a multiplex reaction, patients presented an additional fourth peak corresponding to the mutation (fig 3). Similarly, using only one primer to interrogate the second nucleotide, patients harbouring the TGC→TAC mutation presented two peaks corresponding to G/A reactions (fig 4) in contrast with a single peak observed in normal individuals (fig 5). 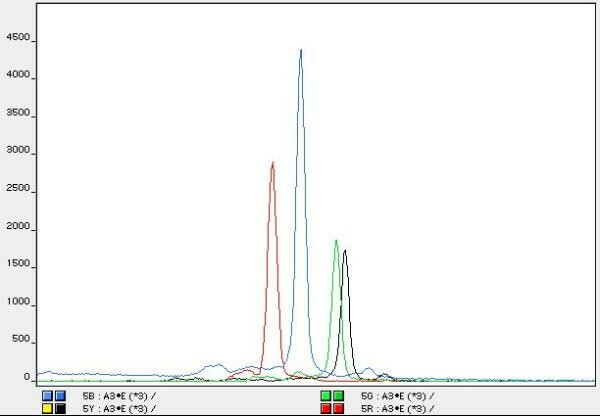 Simultaneous analysis of the three nucleotides reproduced results documenting a fourth peak corresponding to the mutation (fig 6). Analysis of the first nucleotide of codon 634 by a single reaction – pattern observed in an individual heterozygous for the mutation T/C at the first position. Colour is assigned to individual ddNTPs as follows: green/A, black/C, blue/G, red/T. Analysis of the first nucleotide of codon 634 by a single reaction – normal pattern corresponding to the homozygous wild type. Colour is assigned to individual ddNTPs as follows: green/A, black/C, blue/G, red/T. Analysis of the three nucleotides of codon 634 by a multiplex reaction – pattern observed in an individual heterozygous for the mutation T/C at the first position. Colour is assigned to individual ddNTPs as follows: green/A, black/C, blue/G, red/T. Analysis of the second nucleotide of codon 634 by a single reaction – pattern observed in an individual heterozygous for the mutation G/A at the second position. Colour is assigned to individual ddNTPs as follows: green/A, black/C, blue/G, red/T. Analysis of the second nucleotide of codon 634 by a single reaction – normal pattern corresponding to the homozygous wild type. Colour is assigned to individual ddNTPs as follows: green/A, black/C, blue/G, red/T. Analysis of the three nucleotides of codon 634 by a multiplex reaction – pattern observed in an individual heterozygous for the mutation G/A at the second position. Colour is assigned to individual ddNTPs as follows: green/A, black/C, blue/G, red/T. Study of the 2B patient was performed with a single primer designed to screen the most common mutation within exon 16, at codon 918, ATG→ACG. The patient was heterozygous for the mutation showing two differently coloured peaks corresponding to T/C reactions (fig 7) in contrast with a single peak corresponding to T reaction observed in a normal individual (fig 8). Analysis of the second nucleotide of codon 918 by a single reaction – pattern observed in an individual heterozygous for the mutation T/C at the second position. Colour is assigned to individual ddNTPs as follows: green/A, black/C, blue/G, red/T. Analysis of the second nucleotide of codon 918 by a single reaction – normal pattern corresponding to the homozygous wild type. Colour is assigned to individual ddNTPs as follows: green/A, black/C, blue/G, red/T. Using the minisequencing method we were able to recognize all mutations tested (C634R, C634Y, M918T). Present data support the usefulness of a multiplex reaction to identify the mutation responsible for the disease in a particular family whereas subsequent screening of individuals at risk is possible performing a single reaction. Germline mutations occurring in MEN 2 families are clustered in a few codons of RET proto oncogene. Whereas the great majority of MEN 2A families present different mutations at codon 634, the great majority of MEN 2B families present a single mutation at codon 918. Among different PCR based methods used to identify RET proto oncogene mutations in MEN 2 families, complete sequencing is the most reliable procedure. To specifically study codons 634 and 918 we used a minisequencing method as an alternative method to complete sequencing. Using this mutation detection method we were able to reproduce in all cases the information previously obtained by direct sequencing of PCR products. Major advantages of the minisequencing method include its lower cost and speed. The same procedure may be useful for diagnosis of other genetic disorders associated with point mutations at specific codons. High molecular weight DNA from white blood cells was prepared using the guanidine-HCl method adapted from Sambrook . Seven DNA samples from different individuals representative of 5 MEN 2A families, 1 FMTC family and a de novo case of MEN 2B were assayed. All were known to harbour a germline mutation in the RET proto oncogene. Four carried a C634R mutation, two a C634Y mutation and one a M918T mutation. Adequate negative controls were included. Approximately 100 ng of genomic DNA was amplified in a 40 μl reaction containing 20 mM Tris-HCl (pH 8.4), 50 mM KCl, 1.5 mM MgCl2, 0.2 mM dNTPs, 2 units of Taq polymerase and 1 μM of each primer. 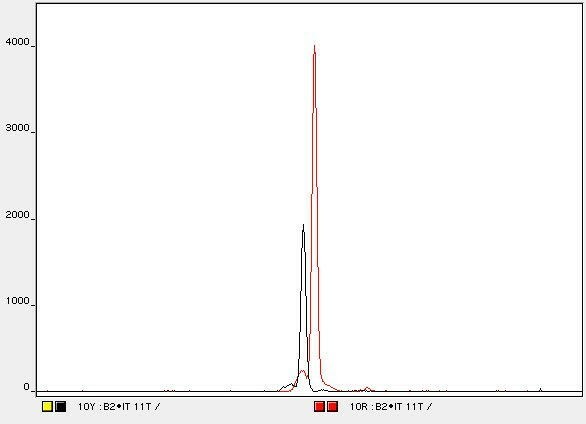 To amplify exon 11 (codon 634) the primers used were CRT19A and CRT19B ; to amplify exon 16 (codon 918) the primers used were 16F and 16 R . Genomic DNA was denatured for 5 minutes at 94°C prior to 35 cycles of denaturation for 45 seconds at 94°C, annealing for 45 seconds at 62°C and extension for 45 seconds at 72°C followed by a 7 minute 72°C polishing step. The reactions were run on a UNO II thermocycler (Biometra, Göttingen, Germany). PCR products were purified through low melting point agarose and eluted using the Wizard PCR Preps kit (Promega, Southampton, Hants, UK) according to the manufacturer's protocol. We adapted the ABI PRISM SNaPshot™ ddNTP Primer Extension Kit (Applied Biosystems, USA) to mutational analysis of MEN 2 families. This technique was primarily devised to detect single nucleotide polymorphisms (SNPs). It depends on a primer extension reaction starting from the purified amplified target. A specific minisequencing primer, which is exactly one base short of the polymorphic site, is used for each nucleotide to be studied. Primer extension reactions are carried out using fluorescent labelled dideoxynucleotides (F ddNTP). Incorporation of the labelled nucleotide is dependent on the genotype. Interruption of the reaction occurs after incorporation of only one terminator. Since purification steps are not necessary, the product obtained is immediately separated electrophoretically; the colour of the peaks obtained makes it possible to identify the SNP or mutation. In order to search for 634 mutations two different approaches were used. First we interrogated each nucleotide separately, performing 3 reactions and using only one primer in each reaction. Thereafter the three nucleotides were interrogated simultaneously performing a multiplex reaction with three primers. Both single and multiplex reactions were performed according to the manufacturer's instructions. Primers were designed to interrogate the three nucleotides and as so to identify any mutation at this codon: 11SST-T 5' atc cac tgt gcg acg agc tg 3'; 11SST-G 5' ccc cca tcc act gtg cga cga gct gt 3'; 11SST-C 5' aaa aaa aaa aat cca ctg tgc gac gag ctg tg 3'. The M918T mutation was easily detected using a specific primer, 16SST-T 5' tcg gat tcc agt taa atg ga 3', one base short of the second nucleotide of codon 918 in a single reaction. 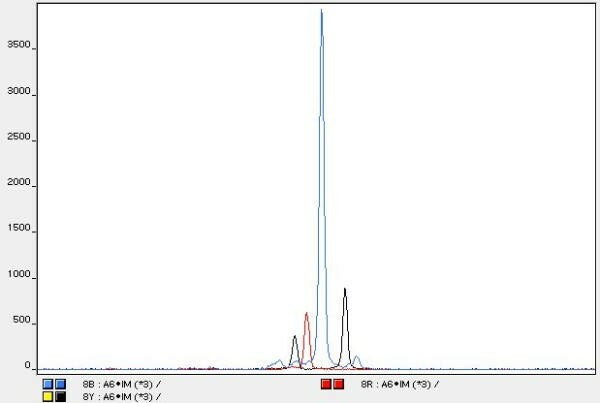 The separation of the products obtained was performed using the ABI PRISM® 310 Genetic Analyzer (Applied Biosystems, USA) with POP 4 polymer, 47 cm capillary. Run time approximately 12 minutes. 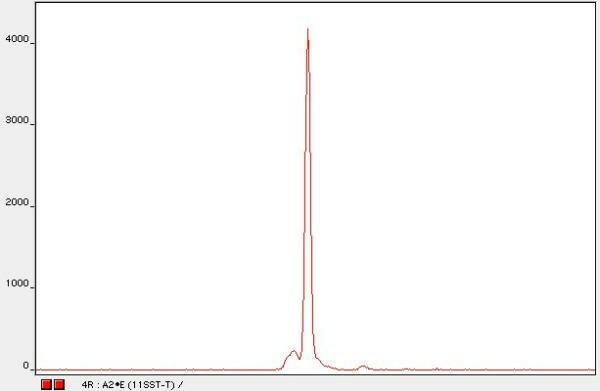 The peak signal was analysed with the GeneScan Analysis Software version 3.1. This study was partially supported by funds from POCTI/QCAIII, Portugal. MJB: Conducted the molecular analysis of MEN 2 families, designed the study and drafted the manuscript. RD: carried out the SnaPshot reactions. LS: participated in coordination of the study and revision of results.